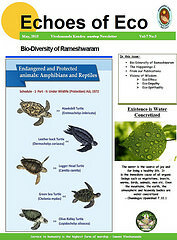 This month newsletter brings you another excerpt from our book on the biodiversity of Rameshwaram - Gulf of Mannar region. Here we present the different turtles as well as the biodiversity inherent in the corals of the region. The Gulf of Mannar region provides a very interesting heterogeneous group of flora and fauna. From this region about 3600 species have been identified. Of this, 186 species are commercially exploited, 116 are vulnerable and 7 are considered as endangered. In the case of fishes of the 2200 fish species distributed in Indian waters, 441 species have so far been recorded in Gulf of Mannar. Gulf of Mannar is one of the best regions in the Indian region in fish biodiversity richness. In our happenings section we bring you a variety of news on such varied activities like construction of bio-methanation plants to Azolla training to ethnic medicine documentation workshops, world Siddha camp etc. We also bring you 'Green Rameshwaram' project news where the renovated traditional water bodies are showing a great sign of recovery with lotus blooms. We have also been conduction bio-methanation plant technology awareness programmes for the household women so that the technology will really go to the people who need them. In our publishing section we bring out eco-toons and facts which point out how food which essentially provides nourishment to body, mind and soul has now become a corporate commodity to be marketed. The eco-toon and excerpt are from our publication 'Samagra Vikas'. In our wisdom section we have a biological anthropologist discuss 'Eco-Ethics' asking us to 'think of the factory- farm cow who has her calves taken away after a few weeks or months, over and over again; about the orca taken from his or her pod in the sea and brought to captivity to perform for us' and we have the writing of Sri Aurobindo which points out that 'all is in all and it is out of the complete involution that the complete evolution progressively appears' . Then we have Kapila Vatsyayan speaking of the 'need to re-learn lessons from those very societies and cultures of the human species where this consciousness was ingrained as a primary article of faith'.